Are you wondering how to start a blog? Getting a blog up and running can be a daunting task if you’re not technologically savvy, but we can help you get there in just a few simple steps. I’m Adrian, resident techie, taste tester and jar opener for Farmstead Chic. I handle a lot of behind the scenes technological stuff for the blog while Kristi focuses on the cooking, photo-taking, social media marketing and monetization. Do it all yourself. You will learn a lot about software, hosting, security, design, and other technical and creative tasks. It’s not as daunting as it sounds and you may actually enjoy it! Let somebody else handle the technical and creative details so you can get down to the fun stuff: creating fantastic content and reaping the rewards of your hard work! In this article, we’ll tell you how to start a blog in just a few simple steps. Pick a blog/domain name and register it. Choose a hosting company that’s compatible with WordPress. Download WordPress if your hosting company doesn’t walk you through it. This may be the easiest part, or the most difficult part. Naming our blog was relatively easy. We knew what we wanted to do and the message we wanted to convey, and luckily we were able to secure the domain name to go with it (more on domain names in just a minute). Your blog’s name could be something simple, such as your name, or your pet’s name. Is it a food blog? If so, think about the types of food you will be presenting on your blog. Is it Whole30 or Paleo? Mediterranean? Or perhaps cheesy and buttery? Desserts, even? It can be clever or descriptive. Simple or catchy. Think about what your content will center on and how you will be helping your readers. It helps to have a memorable name, but the search engine optimization you’ll do later is much more important. The next part of naming your blog is finding a compatible domain name. The domain name is the URL you will use, such as farmsteadchic.com or google.com. It is the website address of your blog. When naming your blog, you’ll have to also consider what your domain name will be and try to find a blog name and a domain name that match. This is the most difficult part of the process. Unfortunately, most of the obvious domain names are already taken, so creativity goes a long way here. Step 2: How do I find a compatible Domain Name? Searching for available domain names can be frustrating but also fun because you’ll see how creative you can get trying to find something that works. Of course, your domain name doesn’t necessarily have to match your blog name, but it really makes sense if it does. To search for domain names, you need to visit what’s called a Registrar. This is a company that sells and manages domain names. Many of these services like Uniregistry, NameCheap, Register.com and bluehost have prominent areas to search for available names. Alternatively, you could do a WHOIS search, which will tell you whether a particular domain is registered or not and if so, who it is registered to in case you want to try to buy it from the owner. Not only can you pick your domain name, but you can also pick an extension. An extension is the .com, .net, .biz, .edu, etc. that goes along with your domain name. For example, Google.com, Google.net, Google.biz, or Google.edu. The most common is .com or .net, but those aren’t always the most available. You can pick from a long list of extensions if you want to. Once you pick a blog name and a matching domain name, you must register the domain. You will want to do this as soon as possible to make sure nobody takes the domain name you’ve picked! There will be an annual fee to do this, and oftentimes there will be multi-year discounts available. Register that sucker ASAP, and pay for as many years as you can afford. I have my blog name and my domain name. Now what? The next two steps are important. If you are going to start a website, you need a hosting company. And you also need blogging software. Your hosting company MUST be compatible with your chosen blogging software. “Hosting” is the company you pay to put your website on the internet. There are many choices and it can get confusing fast. Back in Step 2, we told you about domain names. Some hosting companies like bluehost will actually let you register your domain name with them, and that might actually save you some money depending on the hosting company. Keep in mind that if you go with a cheap hosting plan and your blog gets crazy busy, you will have to upgrade your plan. You might reach the limits of the basic plans very quickly. Our WordPress hosting company choice is A2 Hosting. It’s a little pricier than bluehost but can handle higher traffic without issue. Getting started is easy. Just select your hosting plan, and tell them what domain you plan to use. This is dry, boring stuff. But it is EXTREMELY important. You will want to make sure your WordPress installation is secure from hackers. As prolific as WordPress is, it is a big target. WordPress also tends to run slowly even on big servers, especially when there are lots of plugins, so you’ll also want to enable performance tweaks such as caching. But what if I want help? There are plenty of companies and individuals out there to help you get started with blogging. They can do as much or as little as you want them to. You can ask around to other bloggers or your friends and family, or even use Google to find somebody to help. I run a company called Ravine Software to that handles the blog’s hosting, security, and email for us while Kristi handles the design, content, and SEO. We’ll be happy to handle yours, too. For around $800, you’ll be ready to blog. We will install WordPress on a high performance server, give you a whole year of hosting and help you choose a template and design your site for you. Visit Ravine Software for more details. In conclusion, there are four main steps to getting your blog up and running. Stay tuned for Part 2 of How to Start a Blog where we’ll talk about designing your blog, writing great content, driving traffic to your blog and monetizing your hard work. Not ready to take the plunge just yet? 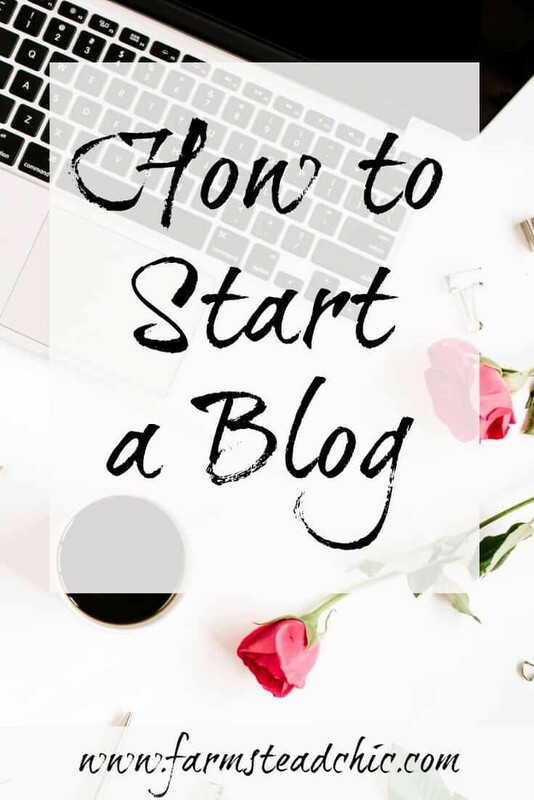 Don’t forget to Pin this “How to Start a Blog” article for later!